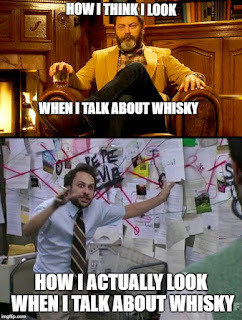 *Disclaimer: Bourbon is not scotch. I know this. Bourbon is delicious though, and I was drinking it before I tasted my first scotch. As such, I offer no apology for including bourbons in my reviews. If you've never had bourbon, I urge you to give it a chance. You shan't be disappointed. In keeping with the spirit of the reviewed beverage, I've chosen to use American spelling conventions, just this once. Bourbon has no legal minimum aging period, except for straight bourbon, which has a minimum aging requirement of two years. Straight bourbon must NOT contain any added coloring or flavoring, which makes some scotch enthusiasts swoon with envy. Any bourbon aged less than four years must include an age statement on its label. Much like scotch, bourbon that has an age stated on its label must be labeled with the age of the youngest whiskey in the bottle. A bourbon that is "bottled in bond" must be the product of one distillation season (January – June or July – December) and one distiller at one distillery. It must have been aged in a federally bonded warehouse under U.S. government supervision for at least four years and bottled at 50% alcohol by volume. The bourbon's label must identify the distillery where it was distilled and where it was bottled. Only spirits produced in the United States may be designated as bonded. 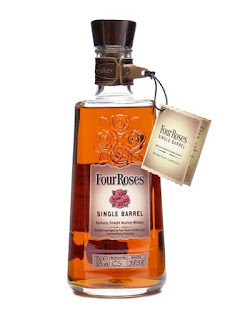 According to their website the founder of Four Roses Bourbon, Paul Jones. Jr. was smitten with a particular Southern belle. He reportedly sent her a proposal, and she replied that if her answer were “Yes,” she would wear a corsage of roses on her gown to the upcoming grand ball. 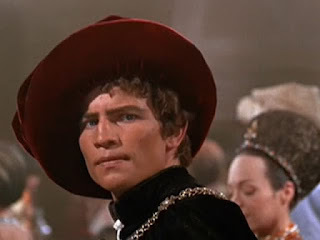 Jones waited for her answer excitedly on that night and when the woman arrived she wore a corsage of four red roses on her gown. 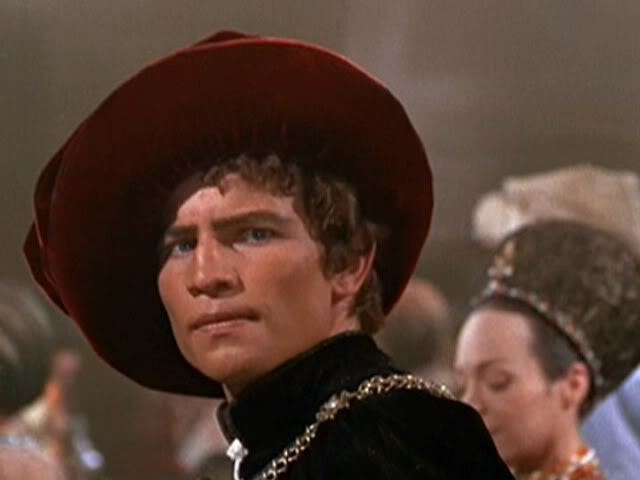 There are no reports as to whether Jones' love interest had a cousin Tybalt who wanted to kill him. Probably not. Jones later named his bourbon “Four Roses” as a symbol of his passion for his wife. 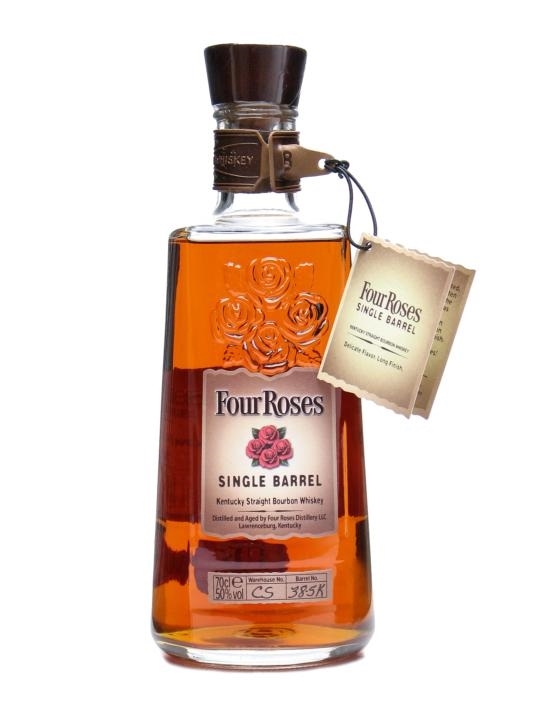 Four Roses survived prohibition, as they were licensed to produce bourbon "for medicinal purposes only". Just look at this bottle. It's beautiful. Even if you don't drink bourbon, you could keep this around as a decoration. You'd be missing out if you did, though. This is a really good bourbon for not a whole lot of money. Finish: medium-long finish, peppery rye, herbal (rosemary) notes with a lingering oakiness. Adding water to this bourbon toned down the pepperiness and bite a bit. The quality of this bourbon did NOT suffer with the addition of water. It's bottled at 50% ABV, so it can take it. Water also pushed the menthol note a bit further back. If you're new to the bourbon world, or even if you only plan on using bourbon when making a tasty Old Fashioned or a Mint Julep, you'd be well-served with Four Roses Single Barrel. Some lower ABV bourbons can lose something when mixed, but not this heavy-hitter. I haven't tasted bourbon as extensively as I've tasted single malt scotch, but this is, without a doubt one of the best I have tasted. Highly recommended.